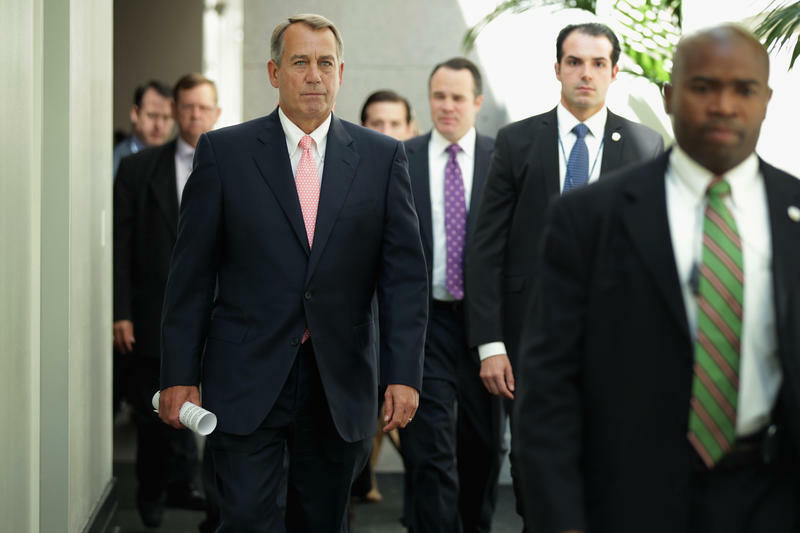 Members of the House of Representatives enter the U.S. Capitol on Monday. 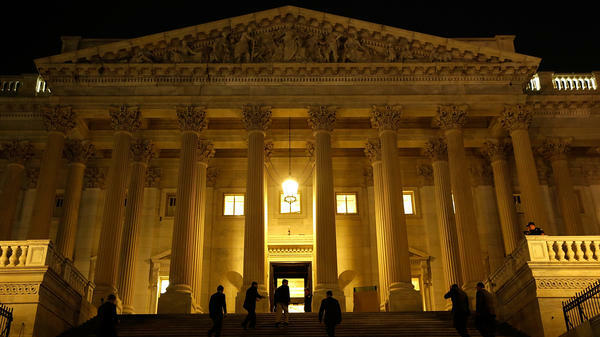 Congress failed to reach a budget agreement by the midnight deadline triggering a partial shutdown of the government. House Speaker John Boehner spoke to the media at 1:15 a.m. ET. He said, in part, "The Senate has continued to reject our offers. But under the Constitution, there's a way to resolve this process, and that is to go to conference and talk through your differences. I would hope that the Senate would accept our offer to go to conference and discuss this so that we can resolve this for the American people." Shortly before Boehner spoke, the House voted 228-199 to re-pass their earlier bill and request negotiations with the Senate on a compromise. Boehner was asked if he would allow a vote on a standalone spending bill that would allow the government to reopen. He answered, "We are hoping that the Senate will take our offer to go to conference and let us resolve our differences." With the shutdown now underway, the U.S. Senate officially adjourned at 12:18 a.m. They are scheduled to convene at 9:30 a.m. where they will return to the matter of finding a deal with the House that will fund the government. This is the first government shutdown since 1996, when President Bill Clinton was in the White House. The Senate leadership had insisted on accepting only a "clean" continuing resolution, as the stopgap spending bill is known. But House Republicans stood their ground, insisting on using the continuing resolution as a vehicle to accomplish their long-held goal of derailing President Obama's signature Affordable Care Act. The final inning of the drama came Monday afternoon, as the Senate rejected yet another version of the House's spending bill that would have delayed Obamacare for a year and President Obama addressed reporters at the White House, accusing GOP lawmakers of threatening to throw a "wrench" into the economy "just because there's a law they don't like." The House countered again, voting 228-201 to pass another bill that would avert a shutdown of the federal government but also delay a key part of the Affordable Care Act. The Senate quickly tabled the amendments and sent the bill back to the House. "I think what the speaker is doing is doubling and tripling down a path that was always intended to take us to shutting down government," Rep. Nancy Pelosi, the House Democratic leader, said at a press conference in the last hour before the deadline. As the minutes ticked away toward the midnight deadline, no compromise appeared and the White House budget office directed federal agencies to begin shutting down. The shutdown means not only will government workers be involuntarily laid off but national parks, with daily attendance of some 750,000, will be closed. After the deadline passed, President Obama sent a pre-recorded video message to U.S. troops and Department of Defense staff assuring them that they would get paid. "If you're serving in harm's way, we're going to make sure you have what you need to succeed in your missions," the president said. "About 800,000 federal workers, many already reeling from the effect of automatic budget cuts, would be ordered to report to work Tuesday for about four hours — but only to carry out shutdown-related chores such as changing office voicemail messages and completing time cards. Once they departed, they would be under orders not to do any government work. "Some critical services such as patrolling the borders, inspecting meat and controlling air traffic would continue. Social Security benefits would be sent, and the Medicare and Medicaid health care programs for the elderly and poor would continue to pay doctors and hospitals." Anticipating the likely shutdown, investors on Monday turned in a disappointing day. The Dow Jones industrial average fell 128.57 points, off 0.8 percent, to close at 15,129.67. The Standard & Poor's 500 dropped 10.20 points, or 0.6 percent, to 1,681.55.